We know that real stories are one of the best ways to raise awareness and inspire action, and we’re lucky to have lots of people who are willing to share them. But how do we do this in the best way? Stories are at the heart of everything we do at Anthony Nolan. In fact, our very name and existence is because of a story – the story of Shirley Nolan and her little boy Anthony. 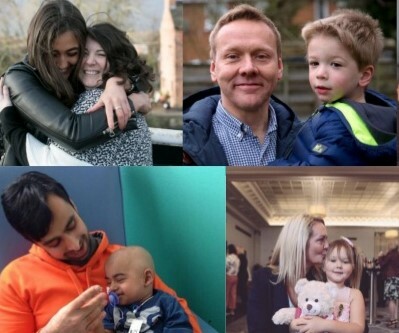 Because of their amazing legacy, every day we’re able to give three people a second chance of life, by matching them with incredible individuals willing to donate their stem cells. When I came on board as stories manager eight months ago, it was a newly created role. There were lots of great stories but they were saved in different places, and there was no consistent way of gathering or sharing them. Over the past few months, I’ve been able to introduce new ways of working, drawing on past experience of what is effective. We share stories not case studies. Every story belongs to a real person and it’s best told by the storyteller themselves. This includes the initial ‘story’ when it’s gathered, as well as each piece of content that we create. This just means that the stories we share are always in first person, in the storyteller’s own words and they always have the final say. I go back to them each time we create something new with their story, giving them chance to approve it. As well as resulting in truly authentic content, this builds trust, puts them in control and shows that we value them – which means they want to keep working with us. We’re very lucky at Anthony Nolan to have lots of people willing to share their story and fantastic colleagues on the ‘front line’ putting them in touch with us ‘story gatherers’ (myself and the press team). I’ll get in touch with a potential storyteller and find out what they’re interested in doing. Sometimes a person just wants to share their story for specific content – like stem cell donor posts, which have a few words from them and a photo. This creates regular ‘in the moment’ content which acts as social proofing and encourages others to join the stem cell register. But for those who are keen to do more, have lots to say, or whose story would be of interest to multiple teams, I’ll offer to interview them over the phone or, where possible, in person. Meeting in person would always be preferable but with limited budget and time, travelling all over the country is rarely an option. Interviews are relaxed and conversational, drawing out their story by asking open questions, while bearing in mind the charity’s key messages and potential audiences. I record the interview (with their permission), write it up and send it back to them to check they’re happy with it. This makes for a really open and honest conversation because they know they can always edit something they’re not comfortable with later. Interviewing, as opposed to asking the storyteller to write a few words or scribbling down notes yourself, gives you richer and more engaging content – both in the amount they say and how natural and ‘human’ it comes across. Reading it gives you a sense of their personality and the way they talk, which makes it more engaging. You also tend to get to the heart of a story and capture more emotion when you let someone talk freely, and is especially helpful for people who aren’t natural writers. That said, there are occasionally people who do prefer to write and I’ve been sent some great blogs. Just gather the story in the way that works best for them. Every time we want to share part of someone’s story, we ask them first and they always get to see the final copy. This has enabled me to build really trusting relationships with people who are happy to keep sharing their story because they know they’re in control and feel valued. People become comfortable sharing some of the most personal and moving experiences in their life – the kind of stories that inspire action – if they trust you. Put yourself in their shoes – even stories with happy endings involve some vulnerability. It can be a big deal to share your experiences publicly. This process also means you can shape a story for a particular audience, while staying true to it. At Anthony Nolan we’re lucky to have brilliant internal copywriters. Sometimes when crafting a particular piece of content, sentences are added to bring a narrative together, and a key message or a ‘call to action’ is written as if it’s from the storyteller. For this reason, checking becomes even more important. I’ve had storytellers come back and say that they’re not happy with how something has been worded or a line that’s been added, so we’ve just changed it. It also recognises that it is their story, not your ‘product’. Storytellers are real people with real lives which continue after the story is gathered and we have to be particularly mindful because their story might change – for better or worse. By having an ongoing dialogue, you get the most up to date story and I now have storytellers who will get in touch with updates or ideas themselves which has led to some amazing new content. We keep track of requests and content that has been created, by adding a note to their record and saving content in their stories folder. As well as getting storytellers’ approval on new content, I follow up afterwards – for example, sending them copies of any printed materials or giving them feedback on the impact. Recently, we took this one step further: in an Individual Giving mailing we featured Claire’s story and included a card so supporters could write her a message. Last week we surprised her with over 500 cards and her husband captured the emotional moment on film (there were a few tears in the office that day). Having stories written up has helped us create powerful films too. The storyteller’s words are used to create storyboards, scripts and interview questions, that can be discussed with the storytellers ahead of filming. This helps them feel comfortable and think about what they’re going to say, which means we get powerful content and save time both on the shoot and during the edit. Remember, it’s never our story to tell, it’s theirs. By giving people the time and the support to share their story, and involving them in the process, you will create authentic and engaging content and find powerful speakers, to inspire action for your cause. Hayley was one of the speakers at the CharityComms ‘Power of Human Stories‘ conference, you can see her slides from the day here.